HomeOur BlogThe 3P INSTRUMENTS booth at POWTECH 2019 – a great success! we thank you for your interest and your visit at our booth at POWTECH (9th -11th April in Nuremberg). 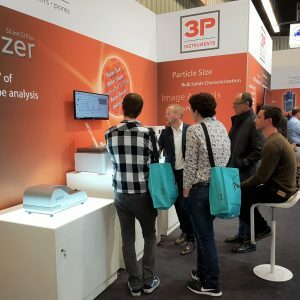 During the three days of the fair, our product specialists provided comprehensive advice on the characterization of particles, powders and pores, discussed special measurement tasks and worked out appropriate solutions. Live Measurements with the BETTERSIZER S3 Plus. A large number of our trade fair visitors arranged test measurements in our central laboratory LabSPA (Laboratory for Scientific Particle Analysis) for contract analyses and their evaluation. Are you interested in one of the methods, instruments or contract analyses, as well? We look forward to hearing from you and will be happy to assist you with competent customer support for your specific measuring tasks.